Silvio Gesell's work is key for the understanding of why re-designing money and land reform is crucial for changing the exploitative system we have inherited. His work inspired the the famous Wörgl Scrip and the legendary WIR system, amongst others. Free money may turn out to be the best regulator of the velocity of circulation of money, which is the most confusing element in the stabilization of the price level. Applied correctly it could in fact haul us out of the crisis in a few weeks ... I am a humble servant of the merchant Gesell. Gesell's chiefwork is written in cool and scientific terms, although it is run through by a more passionate and charged devotion to social justice than many think fit for a scholar. I believe that the future will learn more from Gesell’s than from Marx’s spirit. and read his seminal work, "The Natural Economic Order"
This early experiment directly inspired by Gesell's work took place during the Great Depression in Austria from 1932-1933 for fourteen months. Faced with 25% unemployment and declining funds, the Mayor of the small town of Wørgl thought he would put Silvio Gesell’s ideas into practice. So he put 20,000 Austrian schillings aside and spent a new currency into existence. 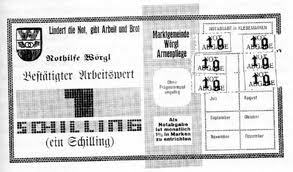 They paid their workers in Work Certificates rather than Austrian schillings and on the back were 12 spaces. Every month the holder would need to stick a one penny Austrian stamp on the back to validate the note. This monthly stamp requirement was sufficient to act as an incentive to spend the note or invest it. Back taxes were paid and there was growing council spending on infrastructure like bridges. People came from miles around to witness what they called the “Miracle of Wörgl”. However, soon the banks put enough pressure on the Austrian government to make the whole scheme illegal, and Wörgl went back to unemployment.